Been a long hiatus but the SYW are back on the table. Been wanting to paint these for a long time. Blue Moon 18mm SYW on 25mm x 25mm bases. 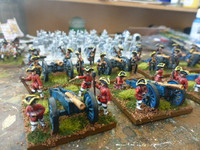 Cavalry will be on 30mm x 30mm when done. 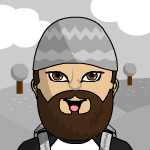 I am pretty pleased with these and I hope you like them. Good figures, but very fine paint job. I'm always impressed after getting my own experience with painting of british uniforms, when they are painted well. I do like the way they have been modelled with unfixed bayonets. I am not keen on having every infantryman in an army wandering about with fixed bayonets, and I often think that the figure itself looks better without bayonets fixed. One thing I particularly dislike is a firing line with fixed bayonets. To be honest it is standard practice for me with all my Horse and Musket period figures. While I do like the look of the bayonets I find that the muskets and bayonets becomes a bit of a spaghetti western and with handling if something breaks it breaks at the hand not the end of the musket. With no bayonet I think the figures are just that little bit more resilient. Similarly I cut off the flag poles and replace with 50mm steel spears. 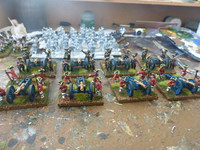 I have 14 battalions a side for the French and Allies and now have 8 French and 2 Allied done. 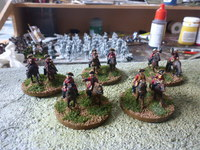 Got 4 more British prepped and then will look to do some cavalry and artillery. 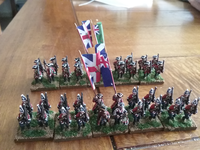 My 51st and 23rd Regiments. Yeah, you would think it would assist in firing quicker (although bayonets of the time were off set to facilitate loading and firing). Unfortunately, I have the opposite problem with some figures that don't have bayonets having read somewhere (and I wish I hadn't) that there was a standing order in the Prussian army for bayonets to be fixed at all times! Happy if someone could confirm I'm wrong because I have a few Prussians in my collection without bayonets and it slightly irks me in an Obsessive Compulsive Disorder kind of way! Just hope Frederick doesn't come along when they're standing there without bayonets fixed! I think that the prussians had no scabbard for the bayonet and I ask myself what should be the benefit for using the musket without the bayonet? 18th century bayonets are no problem if you're loading your musket. We have always the bayonets fixed except when it's raining and we as grenadiers around 1800 have scabbards. I find the problem with modelled bayonets is that they can snap off too readily, or bend and just look silly. 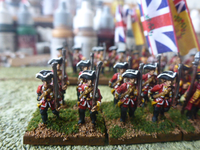 I don’t paint buttons on my 10mm troops, and have recently given up painting things like stirrups and spurs, so I am becoming a lot less OCD about accuracy in my old age. From wargamers distance I can see whether they are Prussians or Austrians and that works for me. I think that it's reasonable for your scale, leman. I myself have problems with the bayonets which bend if they are in metal. This is not so in plastic. That is a fair point Damnitz. I had one particular quandry with Pendraken’s 10mm kneeling firing figure (generic) as it has been modelled without a bayonet, whereas the various standing firing figures have been modelled with the bayonet. I produced an Austrian unit with back rank standing firing and front rank kneeling firing. 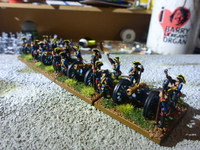 I did not like the look of the finished unit and clipped the bayonets off the rear rank. 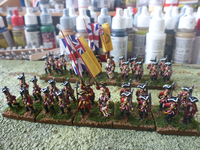 Annoyingly still a slow burn project but some British/Hanoverian Generals done. Very nice generals. I like your style of painting. Thank you. Got some British Artillery undercoated now so time to get things going. 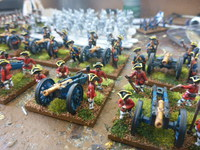 Some British Artillery completed. Getting a roll on here. Just punched out some French artillery too. Nice contrast with the British at the back.